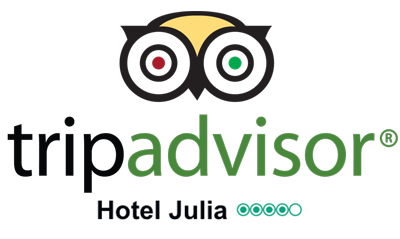 Near Hotel Julia there’s a wide choice of restaurants able to meet all the needs of lovers of Italian cuisine. Pizzeria, wood-fired oven. Piazza del Viminale, 27/31. Tel +39 06 485670. Roman Cooking, specialized in preparing mushrooms. Via del Boschetto 30 (Via Nazionale). Phone +39 06 4744770. Closed on Sundays. Capri specialties gourmets. Its cuisine is inspired and in continous evolution with dishes from the tradition of the Naples area as well as typical roman dishes and creative Mediterranean cuisine. Restaurant “Ambasciata di Capri” serves delicious specialties from the island of Capri, including black ravioli with cuttlefish and the pezzogna, a tender fish that only swims in the waters of the Gulf of Naples. Via Ennio Quirino Visconti 52. Phone +39 06 89928793 - +39 06 45472772. Closed on Mondays. This restaurant is quiet and offers a lot of roman cooking dishes. The specialties is the fresh fishes cooked in regional tradition. Fried vegetables and olive ascolane will delight you. Warm ambient and pleasant manner to have a enjoyable evening. First courses range from a classic roman to light seafood, and entrees are divided between roman specialties and seafood. Via degli Avignonesi 37/38.Phone. +39 06 4885225. Close on tuesday. Restaurant Trattoria Pizzeria. Tipical Roman dishes. Via degli Avignonesi 34. Phone +39 06 4882784. Closed on Sundays. In the old Monti district, the Suburra romana, is the suggestive area where our restaurant La Cicala e la Formica (The Balm-cricket and the Ant) is located. It is told that since the beginning of the twentieth century up to the seventies this place was the refectory of the students of the Engineering faculty, located aside of the church of San Pietro in Vincoli. Now our restaurant offers its tables to enjoy the regional cuisines, the roman one of course, but also the ones of Umbria and Tuscany, with many ideas taken form the southern regions, mainly Campania and Puglia: our cuisine is Mediterranean regional. Via Leonina 17. Phone. +39 06 4817490. Close on sunday. Nautilus restaurant is located in the hearth of Rome, just a few steps froma Trevi Fountain, and Spanish Square. The restaurant ,that has all comforts and it is furnished elegantly with taste, offers you many rooms for the best place availability. Nautilus offers you a menu with a lot of italian specialties, and you can taste local and unique flavours of Sicily mediterranean cooking , with every day fishes delivery. the tastiness of a unique cooking, absolutely genuine made Nautilus reported in La Repubblica newspaper, and insered in the japanese website of JCB as a reliable restaurant. Via dei Serviti 28 (Largo Tritone). Phone. +39 06 4819829. Close on monday. In Rome from 1953 offers meat dishes, fish and pizza. Via Pannonia, 22-26. Tel / Fax 06.77208187. Closed Mondays.